Might there be Microbes on the Surface of Mars? Martian micro-organisms would be of extraordinary interest for the life sciences, especially if interestingly different from Earth life. In the past Mars was much more habitable than it is now, so most of the focus was on past life, and deep habitats beyond the reach of our rovers. Recent research suggests the intriguing possibility of life in tiny micro-habitats within the top few cms of soil and in some cases, right on the surface. Might this apparently barren landscape harbour life? Scientific opinion waxed and waned over the years. It was at its lowest point in the 1970s, when I was young. Most scientists in those days thought that Mars doesn't have life, and never had life. I've seen a renewal of interest life on Mars since then. It started with the discovery of features that look like river channels and evidence for ancient seas on Mars. Scientists began to think that perhaps Mars was habitable in the past. Then came the idea of life deep below the surface, sustained by geothermal processes. Recently, researchers are enthusiastic about the new idea of surface microhabitats on Mars. These might be no more than a droplet of water melting around a grain of sand in snow or a millimeters thick patch of cold salty brine just below the surface. It's not much to live on, for sure. Possibly intelligent life, on an arid planet, with Martians building canals for irrigation to bring water from the poles of the planet to the dry equator. Living micro-organisms may be there on the surface right now, in microhabitats. She, like most of the other researchers, focused her talk on microbial life. Some lichens also could perhaps survive on Mars. Intelligent life however, now or in the past seems extremely unlikely to most. Sadly, we will probably never return to the canal building Martians idea (as attractive as it is). What lead to the changes in scientific opinion? So, why have opinions of life on Mars changed so much? Why was there so much skepticism in the 1970s? What has changed in the last few years to lead to an increase in optimism for microbial life on Mars nowadays? I'll start from the beginning as I think it helps to get a clearer picture of modern ideas about Mars to understand where they fit in the historical picture. draw gigantic geometrical diagrams in the deserts. They thought that Martians might observe Earth through their telescopes, just as we observe them with ours. By making changes in our planet visible to astronomers on the other planet, we could communicate messages to them, and they to us. This of course was before modern radio, and the discovery that you can use it to communicate through interplanetary space. Similar ideas were suggested for communicating with astronomers on the Moon, if they existed. He thought that Mars was a desert planet with the canals built by intelligent Martians to irrigate their dry world. Later, telescopes became more powerful, and photos of Mars were taken, The astronomers didn't see any canals. Perhaps they were an observer effect, a tendency of the eye to see straight lines in images. They could do spectrographic observations of Mars by then, and these showed no sign of water vapor in the atmosphere. The idea of canals on Mars was already pretty much ruled out by the opposition (close approach of Mars) of 1909. They also found that there was no oxygen in the Martian atmosphere.Earth like animal life seemed unlikely. Yet many astronomers still hoped for some life on Mars, especially plants, and micro-organisms. This idea of intelligent martians irrigating their desert world with canals, as popularized by Lowell, was too good to forget about, and caught the public imagination . By the time these later books came out, the idea was no longer accepted by most astronomers, but had was deeply rooted in popular culture. Mariner 4 pointed its cameras at the Martian uplands, the most Moon-like part of the planet, and the photos were low resolution. Some held out hope. as it would be easy to miss life with these limited observations. Next came the Viking landers. These took pictures from the surface, and searched for life directly. To many, these seemed to finally put an end to all hope for finding life on Mars. These Viking photos showed a barren landscape, The UV flux was so strong it was thought it would sterilize all life within a minute or two, and the soil was rich in perchlorates, thought at that time to be lethal for life. 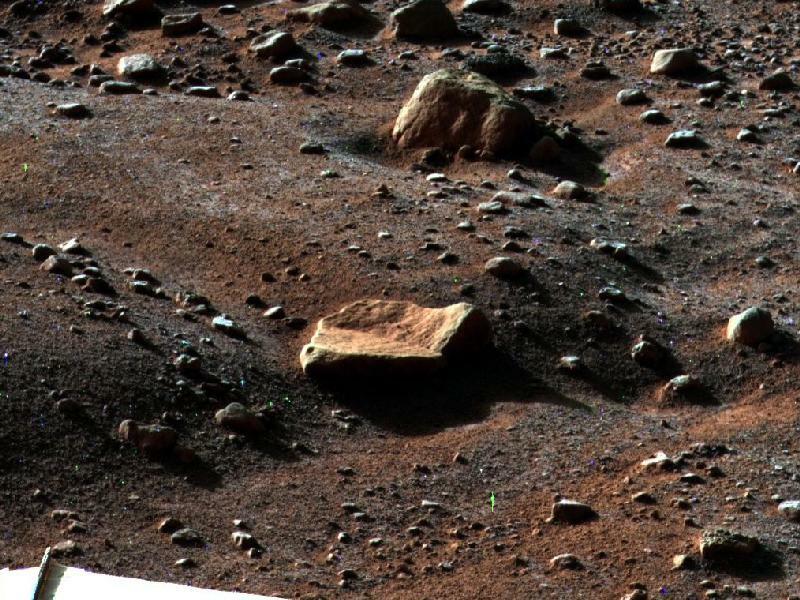 Modern photos from Mars may seem to show a more habitable environment than these photos suggest. That's mainly because the images are manipulated to show the colours you would see under Earth sky illumination. See: Catalog Page for PIA16800 - most images of Mars we see are colour adjusted as in the right-most image. The central image gives an idea of what the landscape would be like to a human eye. This makes it easier for geologists to identify rocks, but has a tendency to make Mars seem more congenial for life than it is. This was the situation when I grew up, as a teenager and young man. Life on Mars seemed extremely unlikely, and unlikely to ever arise, unless we brought it there ourselves. One of the Viking observations was puzzling, the "Viking Labeled Release" experiment. It was hard to explain as non life, but it didn't seem to exactly fit what life would do either. This experiment has remained controversial ever since. All the other Viking experiments ruled out life, but this one anomaly kept a possibility alive amongst a few researchers, that somehow, the other experiments were missing something. So far there have been no follow up experiments to attempt to find out in detail what happened in the Viking labelled release experiment. As a result ,the matter hasn't yet been fully resolved. Most scientists eventually decided that these labelled release experiments were probably not life, though not yet completely understood. All the other life detection experiments and the readings of surface conditions suggested an environment extremely hostile to life, and that was the prevailing scientific view in the late 1970s. James Lovelock,came up with an intriguing argument in the late 1960s and early 1970s. He was a researcher looking into the possibility of life on Mars. Most NASA scientists were convinced by Lovelock's arguments and the data from Viking and Mariner, gave up the search for present day life. NASA redirected it's focus from a search for extant life to a search for conditions for past life and for water in the past. This eventually bore fruit, with suggestive evidence for occasional water even in the fairly recent geological past, and large quantities of water in the first few hundred million years of the Mars geological history. This started with observations from orbit of what look like river channels, and ancient sea shores. After a while the river channels were accepted, was hard to think of anything except water that could form them. It took a while for the ancient seas to get accepted but most agree now that Mars probably had seas in its ancient past. Ancient northern ocean on Mars - the ocean in this artistic rendering was from 3 billion years ago and probably remained liquid for only a million years. An earlier ocean is thought to have formed 4 billion years ago when the atmosphere was thicker, and lasted for several hundred million years during the Noachian period on Mars. Other work suggested the atmosphere was much thicker in the past and was either lost to space, or more likely, absorbed as CO2 into the regolith. This gave rise to the idea of an early habitable Mars almost Earth like in its climate, which gradually turned into a desert planet, but was reasonably habitable for as much as a few hundred million years. You could say that the Martian scenario of the science fiction Martians did play out on Mars, but it happened over three billion years ago, on a planet almost certainly hosting no life more complex than primitive cells (if that). We come to the scene far to late to see it in action. If Mars was habitable in the past, there might be evidence of past life there to this day. That seems especially possible because Mars has no continental drift, so it might not be that hard to find relatively unchanged deposits from billions of years ago. This is one of the main goals of the current exploration of Mars, to find evidence of early conditions there, and if possible, even direct evidence of life or early life processes on Early Mars, or of abiogenesis (the process of evolution of life). However, if life did arise on Mars in the past - is it possible that it still survives? Life can be amazingly persistent on Earth, could the same be true on Mars? This was an idea current when I was younger, that if not habitable right now, it might be habitable occasionally. When it is tilted at its most, then its polar icecaps probably melt, and CO2 may be released, making its atmosphere slightly thicker, just enough for liquid water to form in the lowest points on the surface (such as the Hellas impact basin). This may happen briefly every few tens of millions of years. Life on Mars might thrive during these brief warmer spells. Perhaps Mars is only occasionally habitable, so its atmosphere goes out of equilibrium briefly every few tens of millions of years. One problem with this idea was, what does life do in between those periods of habitability of Mars? Present day Mars is extremely dry. Astronomers in the late twentieth century thought that, although ice is abundant, there was no possibility of liquid water, because in the near vacuum it would evaporate as soon as it formed. Any liquid water, they thought, would need to be isolated from the surface to prevent this evaporation. Some micro-organisms on Earth can be revived after long periods of dormancy, possibly after millions of years. So this gave reason for hope. Perhaps the microbes simply remain dormant in between until the next warm spell. It would be like hibernation for animals, except that microbial life can go dormant for millions of years and stay dormant through changes of obliquity, rather than the few months of sleep through the cold of winter of an animal. The problem is, what about cosmic radiation? Cosmic radiation actually refers to highly energetic particles, so a form of "ionizing radiation". This is much stronger on the surface of Mars than on Earth, because of the lack of atmosphere. So could micro-organisms stay dormant for long periods on Mars? Can People Go to Mars? Credit: OBPR. It's not instantly lethal by any means. The dose on the surface of Mars is about 0.7 mSv per day (measured directly by Curiosity). This compares with the dose inside the ISS of 0.5 to 1 mSv. Living reproducing micro-organisms have no problem coping with this. The problem is the cumulative radiation dose that builds up in dormant life over long timescales. Researchers found that any dormant life within the top few meters of ground would be sterilized by cosmic rays in time periods much less than the tens of millions of years between habitable periods on Mars. Active life can withstand these doses easily, indeed some micro-organisms can survive far stronger doses., Radiodurans for instance ("Conan the bacterium" the famous polyextremophile) is found in reactor cooling ponds and can survive a thousand times the dose lethal to a human. Radiodurans can repair damage to its own DNA (without reproducing) within a three to four hours (Rising from the Ashes: DNA Repair in Deinococcus radiodurans), so would just need to waken briefly every few thousand years to survive. It can only do that if it wakes up. If completely dormant even radiodurans would get killed over hundreds of thousands of years, within the first few meters of the surface of Mars. This makes it hard for life to survive long term dormancy on or near the surface of Mars. The prevailing scientific opinion was that long term dormancy and the absence of any present day liquid water seemed to rule out the possibility of present day or revivable life on the Mars surface. Only a few years after James Lovelock produced his argument against life on Mars, a remarkable discovery was made, entire communities of creatures living deep under the sea, too deep to use light to survive. These were the hydrothermal vent communities. These ecosystems are more or less cut off from all other ecosystems, and derive energy from hydrogen sulfide and other chemicals rather than light. The multicellular life depends on oxygen dissolved in the sea water, but many of the micro-organisms don't need the oxygen. So then, the idea arose - what if there is some closed ecosystem deep below the surface of Mars? Such a system could be based around a geothermal heat source for warmth, or if deep enough, just the heat of the interior of Mars itself, and a chemical source for energy. The life in these underground habitats would be isolated from the surface, so the atmosphere of Mars would remain in equilibrium. This gives a way around James Lovelock's argument. We might be unable to detect this life except by drilling into the deposit it lives in. As the twentieth century continued, more and more such systems were discovered on Earth. Life was also discovered in deep drillings on Earth that required no source of oxygen, and could survive in similar conditions on almost any planetary body with sufficient heat and with some water source. Perhaps it too could exist deep below the surface of Mars? Over most of the Mars surface, liquid water can hardly form at all, because the boiling point of water is at most a few degrees above its freezing point. (The low atmospheric pressure on Mars reduces the boiling point, and makes almost no difference to the freezing point). Hellas Planitia impact crater, floor is 7.000 m below the surface of Mars and atmospheric pressure at base is below triple point of water so liquid water can briefly form but would soon evaporate. Deep underground, the pressure is higher, and so water can be liquid at higher temperatures. It can also get trapped below impermeable layers, just as oil does in oil wells on Earth. This solves both problems, gives you liquid water, and yet keeps the ecosystem isolated from the Martian atmosphere. That was the situation until about 2008. Rovers on Mars might find evidence of ancient life. If we were able to drill deep below the surface we might find evidence for life there too. Until 2008, present day life on the surface still seemed extremely unlikely to all except a very few scientists, and some eccentrics. Gradually, ideas were developed and new discoveries made that made life in the harsh Mars surface conditions seem more possible. Many different strands of research came together to change our ideas in this way. Single species ecosystems deep underground, or in deserts. These species are primary producers, they get all their energy from sunlight or chemical sources. Terrestrial analogues for Mars include a cyanobacteria that lives beneath transparent rocks in deserts. Another single species ecosystem of relevance ot Mars is a chemoautotroph found deep underground. Sparse habitats were found in places such as the Antarctic dry McMurdo valleys. These have so few micro-organsims, metabolizing so slowly, that they would make no noticeable difference to the Martian atmosphere. They might be hard to spot even if you look directly at the habitat they live in. Wright valley, one of the McMurdo dry valleys in Antarctica and one of the closest analogues of Mars on Earth. High levels of resistance to UV, some microrganisms able to survive Martian surface UV for years in layers. Some lichen can slowly metabolize and photosynthesize on the simulated Mars surface (mainly in somewhat shadowed locations on the rocks - but still, they are able to photosynthesize, and protect themselves from the UV radiation). New soil types found by the rovers on Mars including sulfates (great for preserving organics for long time periods), basalts, also clays, and alkaline soils as well as the already known acid soils. Experiments using Mars analogue soils suggested that Earth life could survive in these Martian soils and would find it only mildly toxic, As a result the observations no longer seem to indicate a Mars surface totally hostile to life. If you can have liquid water in some form on or near the surface of Mars, then life seems possible there. In 2008 the first hint of a possibility of liquid water droplets and thin films on the surface of Mars arose from a surprising source. This started with the serendipitous discovery of what look like droplets on the Phoenix lander's legs in 2008. This forms extremely salty solutions that are liquid at low temperatures and so don't have the problem of boiling away that ordinary liquid water does. They are also metastable, so once formed, they can cool below the eutectic limit (freezing point for mixture of salts) and warm up again without refreezing. This gives a possible habitat for life on Mars since there are halophiles (salt loving) micro-organisms on Earth that can manage fine in salty conditions, and the psychrophile halophiles also like extremely cold salty conditions. They would be right at home on Mars in these briny droplets. Many of these habitats have now been proposed - though none have actually been proved definitively to exist. Even the Phoenix lander leg droplets are not conclusively proved to be salty liquid water and scientists remain skeptical about them. However the range of possibilities is quite large. No lakes or ponds, those seem impossible on the surface, sadly. But there are many possibilities for droplets and thin layers of brine on Mars. In a thin desert like habitat, with a sparse and slow growing population, you wouldn't expect to see any change in the atmosphere. Experiments with Mars analog soils find that in practice, the soil types are variable and not especially hostile to Earth life. Some micro-organisms can use the perchlorates as an energy source. This is a problem if the life has to remain dormant on the surface for geological time periods. It is not such an issue if microhabitats continue to exist on Mars through the variations in the axial tilt. Many UV radiation resistant micro-organisms are known. Micro-organisms can be sheltered from UV light by a few mm of soil, inside a rock or in a crack in a rock, or in a shadow. 5. Generally hostile conditions such as the extreme cold and temperature variability, near vacuum for atmosphere etc. New studies of extremophiles and polyextremophiles suggests these are not nearly such a problem as they seemed at the time of the Viking era researchers. For sparse desert like habitats, one possible source is the influx of micro-meteorites. Calculations suggest that they could maintain levels of between 1 and 10 ppm of methane to the soil. This is comparable to desert soil levels on Earth. Here is Chirs McKay's talk about some of these issues at the "Present day habitability of Mars" conference. Of the main elements needed for life, the one element in short supply on Mars is nitrogen. There is some in the atmosphere but only 0.2 mbar. Can life use that? Or is there some other source of nitrogen on Mars? Nitrogen can be fixed by volcanic processes and lightning. It has proved hard to detect these low levels of nitrogen compounds with the rovers on Mars, The phoenix lander looked for them but instead found perchlorates which would mask the signal from organics. Indirectly, there is evidence of nitrates in martian meteorites on Earth, these however seem from their isotope ratios to have formed when Mars was young. MSL may find nitrates on the surface, and there is preliminary suggestive evidence that it has, possibly in the form of ammonium nitrate. Perhaps some of these sources could provide enough of a source of nitrogen for these microhabitats. This evidence came about thorugh a reinterpretation of the Phoenix lander result sin 2010 by Paul Niles, a space scientist at NASA's Johnson Space Center in Houston,. He found intriguing indirect evidence that CO2 in the atmosphere has interacted with water in the geologically recent past. The low gravity of Mars favours loss of carbon-12 to space compared with carbon-13. The ratio of carbon-13 to carbon-12 measured by Phoenix is at a level that suggests that the atmosphere of Mars must have been replenished from volcanoes recently. The proportions of the isotopes of oxygen-18 and oxygen-16 in the CO2 however show a signature characteristic of oxygen that has had a longer period of time to get lost to space. This suggests that the CO2 must have reacted with liquid water in the geologically recent past.
" Niles and his team theorize this oxygen isotopic signature indicates liquid water has been present on the Martian surface recently enough and abundantly enough to affect the composition of the current atmosphere. The findings do not reveal specific locations or dates of liquid water and volcanic vents, but recent occurrences of those conditions provide the best explanations for the isotope proportions." This may be an indirect observation of habitats with liquid water on the surface of Mars. So lets look at the possible habitats in some more detail. I'll pay particular attention to the February conference, "Present day habitability of Mars",with links to the video presentations which you can watch yourself to find out more about some of these ideas. First, over many areas of Mars, thin layers of salty brines could form in this way through deliquescence just a few mm below the surface. The permafrost layer on Mars is close to the surface, just a cm or so below the surface. But in midday at many latitudes the surface heats up to well over 0°C and indeed can heat as far as 20°C or more. Here though, we are talking about films several mms thick, easily enough for life to survive, similar to the droplets on the Phoenix lander. A fine balance is needed, as salt mixtures which deliquesce at the lowest temperatures, -40°C or lower, have low water_activity, which is used as a measure of whether or not life can make use of the water. Though easy to form, they are unlikely to be suitable for life. Other mixtures deliquesce at higher temperature, and tend to have higher water activity, but can only form close to the surface where temperatures are highly variable. They are prone to evaporation as the temperatures increase. Since the source of water for these microhabitats is the humidity in the air at particular times of day, they could continue to form every year indefinitely. The water supply would not get exhausted, and it seems a possible habitat for sparse slowly metabolizing micro-organisms. Grains of dust could fall into the snow, heat up with the sun, and form a micro-habitat. Since life lives in snow on Earth it seems a possible habitat on Mars. These changes in the features of Mars strongly suggest seasonal flows of some kind. However they are poorly understood, It is hard to see what could continue to supply water for the flows over geological periods of time, as there is no precipitation from the atmosphere right now to replenish them. Any sources of ice would be last replenished during the most recent time of high obliquity (tilt) of the Mars axis at least hundreds of thousands of years ago. The ice may be coming from below slowly moving up through the ground a few mms at a time to the surface, but this too is hard to explain over geological time periods. So, this has to be a decided "maybe" at present. But, there may be salty brines involved in the process, and if so, it might be a habitat for life. The DLR lichen experiments suggested that it may possible for life to survive and grow gradually using just the water vapor in the atmosphere. In the morning and evening on Mars, the humidity in the air reaches 100% and it briefly condenses to form the thin early morning and evening frosts. In these same conditions, lichens can absorb moisture directly from the air and use that to support growth. See Metabolic Activity of Microorganisms During and After Simulated Mars-like Conditions – What Do We Learn about the Habitability of the Red Planet? They are able to withstand UV radiation through the protective effects of usnic acid (an organic compound possibly unique to lichen), melanin and parietin (another possibly unique lichen compound). These are probably not water geysers, they may for instance be CO2 driven, but some ways of understanding them could make it possible for life to survive in their plumes. 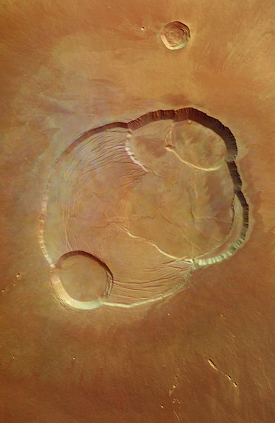 These areas of Mars look especially intriguing in the satellite photos. "They were first seen in 1998; they don’t look like anything we have here on Earth. To this day, no one is sure what they are, but we now know this: They come, then they go. Every Martian spring, they appear out of nowhere, showing up—70 percent of the time—where they were the year before. They pop up suddenly, sometimes overnight. When winter comes, they vanish. " They strongly resemble terrestrial life patterns, so much so that Arthur C. Clarke famously suggested that it actually is life. In a 2001 interview he said "The image is so striking that there is no need to say anything about it -- it's obviously vegetation to any unbiased eye.". More scientifically, in 2002 a Hungarian team suggested that the seasonal growth patterns could indicate life processes. This remains a minority view. What is clear to all is that these photographs show the Martian surface to be a surprisingly dynamic place. Some of these changing features could provide niches for life. 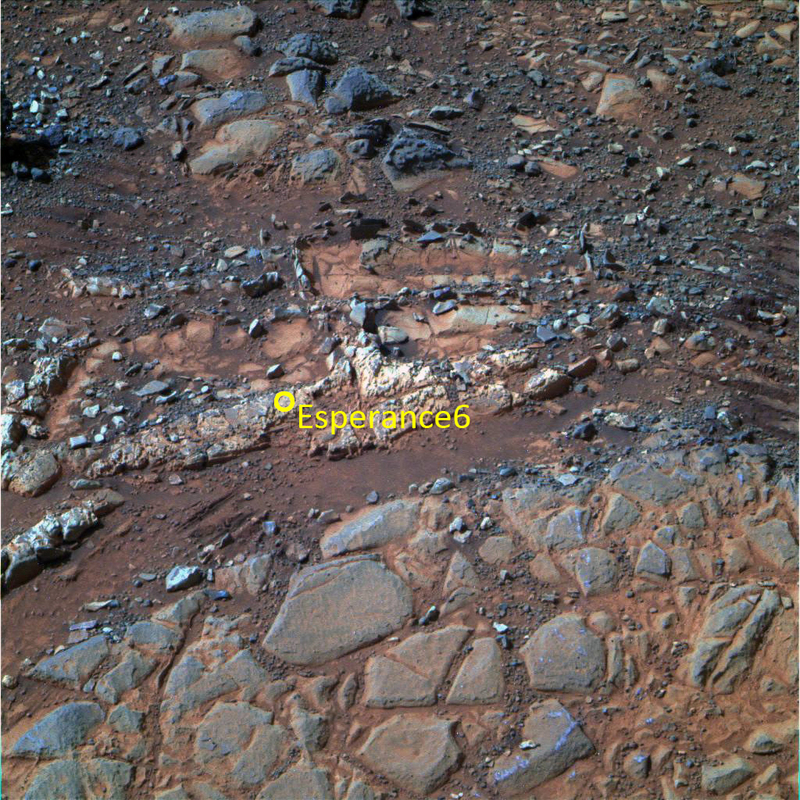 Many Mars rocks have a shiny coating that resembles desert varnish on Earth. Desert varnish on Earth has life associated with it (if not necessarily causing it). On Mars perhaps it could have life associated as well? The life could coexist or help to create it, or it could have traces of earlier life preserved by a covering of desert varnish. It is not yet proven that it is desert varnish in the sense it is understood on Earth. 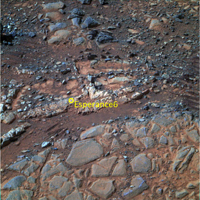 Recent observations by the Curiosity ChemCam may be of interest. Habitats may form beneath translucent rock, as happens on deserts on Earth. For instance this could be an ideal location for cyanobacteria. "The rocks provide some shelter from the extreme desert conditions and retain a little bit of moisture in an otherwise hyperarid environment. Because the quarts rocks are translucent, they filter surface sunlight and therefore provide just the right conditions for cyanobacteria to be able to photosynthesise and flourish." This is far more speculative than single cell life. 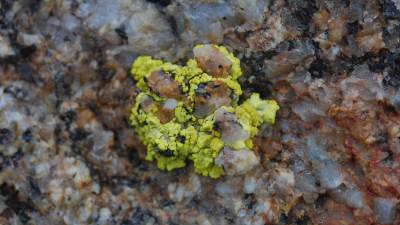 Multicelular plant life in the form of lichens might well survive, as in the DLR experiments. But it is hard for animal life to survive totally without oxygen. Almost all multicellular life on Earth depends on it. The giant tube worms and other multicellullar life of hydrothermal vents, though isolated from the surface almost totally, still depend on dissolved oxygen in the sea. Water bears are extremely hardy and could withstand the conditions in a dormant state. But could they reproduce? Could there be oxygen rich micro-habitats on Mars for them to live in? One interesting development is the discovery in 2010 of multicellular creatures living without oxygen (more details from the researchers). These tiny creatures, species of Loricifera, live in anoxic conditions, and make no use of oxygen at any stage in their life cycle. They rely on hydrogenosomes in the place of mitochondria. They are tiny millimeter scale creatures. Might something like this evolve on Mars? The outcome of all this research is a new up beat attitude to the possibility of life on the Mars surface, with many papers published every year. Paige plans to start a new journal devoted to the topic of the present day habitability of Mars. So far we haven't sent anything to Mars capable of detecting present day life in these habitats. Curiosity was only sterilized to Category IVa which means it isn't clean enough to visit a habitat that might have present day life, and its tools for detecting life are limited, and it doesn't have the exquisite sensitivity that some future suggested instruments might have. Also Curiosity can't dig any depth below the surface. ExoMars will be the first rover with this capability (up to 2 meters depth). As for ancient life, then any remains in the top few meters would degrade over geological timescales. So again, it's perhaps not too surprising if we don't find any unambiguous traces of early life. We would surely have found it by now if abundant, there are no layers of organic rich shale. But if ancient life on Mars was also sparse, we would have little hope to find it on the surface. So, there is no way yet to know for sure if life ever existed on Mars, or whether it still exists there right now. These life forms might be extremely hard to detect even when you sample the habitat directly. That's because the population may be very low indeed, especially if a single species ecosystem and the micro-organisms don't require each other's company to survive. There might be so few micro-organisms that you don't see any visual difference in the habitat due to them on the macro level, and chemical traces of their presence may be subtle. Individual cells may be extremely small (well sub micron) and rare. They might be uncultivable. Perhaps warming up or giving them more nutrients kills them. This might mean you can't use labelled release. They might not use DNA in the terrestrial sense. It might be similar to our DNA but use different bases. Or it might be mirror image DNA or might be some other chemical altogether. This could prevent DNA sequencing from working at all. This also is a challenge. As with the surface life, then life may be sparse. The deep subsurface layers would require drilling to reach. For ancient life, the best place to look might be in ancient clays or sulfate deposits, good for preserving organics over geological time periods. But the surface layers have been bombarded with cosmic radiation which damages life chemicals over periods of hundreds of thousand s of years. What about optical observation of life? The best optical instruments sent to Mars have sent have resolutions of well over 10 microns, which misses the details that interest a microbiologist. Many cells, spores and dormant states are too small to be seen at all at this resolution. Perhaps this reflects the geological priority of missions to date? A good quality diffraction limited optical microscope on Earth has a resolution of 0.2 microns, which is what you need to see cells clearly in a microscope. 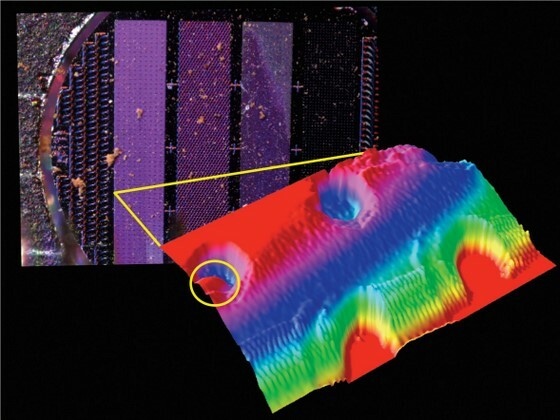 The atomic force microscope on Phoenix had a resolution of 0.1 microns, better than an optical microscope, and by far the highest resolution imager sent to Mars to date. But it could only image small areas, and it works by different principles, creating a 3D map of the surface, and is not an optical microscope. Apart from that, nothing has been sent with much of a chance of imaging any except the largest micro-organisms. A good optical microscope could still miss present day life. For instance, if unfamiliar in structure, it might take a while before you realise that it is life. Also, ultramicrobacteria would be hard to spot (0.2 - 0.3 microns across). The controversial martian "nanobes" if they exist would need higher magnifications, such as an electron microscope (smallest are 20 nm in diameter, about a tenth of the size of the ultramicrobactera). Yet, it seems that there is a chance of spotting microbes on Mars optically, if they exist. I don't know of any project to send more sensitive optical microscopes to Mars. The new ESA rover ExoMars, due to be launched on a Russian spacecraft, was originally going to have an instrument package called Urey that would bring a far higher level of sensitivity to life detection on Mars. Sadly it has been descoped because the weight limits were reduced. A newer idea for ExoMars is the Astrobionibbler, another ultra senstive life detection instrument a quater of the size of Urey. It is so sensitive that it should able to detect a single occurrence of an amino acid, within a sample. Further into the future, NASA are working on a miniaturized scanning electron microscope for spacecraft. Craig Venter is working on a miniaturized DNA sequencer. Then Gilbert Levin has designed a new version of his labelled release experiment that checks for chirality. So, there are ideas and plans for much more sensitive instruments to Mars in the future that may spot life signs or life directly. Will we find life on Mars? At the moment, there is no way to tell if life will be discovered or not. Either way the answers are fascinating. Did it come from Earth or evolve independently. Might Mars have lifeforms with multiple origins, some micro-organisms from Mars, and some descended from Earth? Does it all descend from a single ancestor or did life evolve there more than once, perhaps in separate locations on the surface of Mars? How did life develop from non life on Mars? Since Mars had no continental drift, then if life did evolve from scratch there, there may be evidence for the process of development of life from non life in exquisite detail. 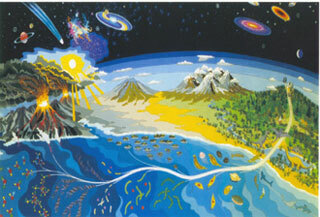 On Earth there is no direct evidence at all from the early stages when life first began to form. There seems no chance of finding it either. Mars has deposits of salt and sulfates, and these could preserve organics almost unchanged. Some may have remained in conditions of "deep freeze" temperatures well below 0°C for billions of years. Possible ancient, well preserved microfossils, nearly 3.5 billion years old. There are older possible micro-fossils but these are especially well preserved. If life evolved on Mars, there may be not just fossils, but organics too, kept in a "deep freeze" of salt and sulfate deposits from those ancient times, because of the extreme cold and the stable geology of Mars. There are many hypotheses about abiogenesis - the origins of life. The earliest life we know is still amazingly complex, with typically a million different types of molecule in a single cell. How did something so complex arise? How did the cell structures, their metabolism for generating energy, the RNA and DNA for maintenance, repair and reproduction, and all the complex chemicals and processes in a cell, all come together to create a single reproducing micro-organism? How did the very first cells reproduce? How did the complex organic compounds needed as precursors for life first form? There are many alternative theories of abiogenesis,. There isn't enough evidence so far to decide between them, and there seems little hope to ever find enough evidence on Earth to decide this conclusively. If life never evolved on Mars, it would be fascinating to find out how far it got along the process. Were some pre-life "experiments". Why didn't it evolve there, when early Mars was such an Earth like habitat. How far did processes go on the route to abiogenesis? Were complex organic compounds available? What about DNA, RNA, or a metabolism, or protocell structures? Were any alternative biochemistries explored? This might help us have a better understanding of the origins of life on Earth, and possibly alternative pathways life can take. Also, it might tell us a lot about the prospects for life on other planets in our galaxy. Who knows what discoveries these may yield about past and present life on Mars? Or what insights it might shed on life processes and the origin of life itself? Cosmic Evolution - Image from exobiology program at NASA Ames Research Center . Absurd Blog Post At Arctic News Predicts 10 °C Rise In Global Temperatures By 2026 - QUADRATIC To EXTRAPOLATE! science and medicine,you're in the right place. At Science 2.0, scientists are the journalists. we can't do it alone so please make a difference. educated over 300 million people.